The Ultimate Beach Get-Away! Live the life of luxury in this private Ocean front home. Home is situated on an acre of beach front property, just a step to the Pacific Ocean. Spectacular Mountain and Ocean views from every room in the house! Over 300 feet of Ocean Frontage....waves crashing into the living room! This modern beach house features state of the art chef’s kitchen with stainless steal sub-zero refrigerator and freezer drawers, 6 burner stove with grill, double oven and oversized granite island/dining bar. Home has a spacious, open, California style floor plan. Home features an open living/dining room with a wood burning lime stone fire place, family room, separate screening room with oversized wet bar and poker table, office, master suite opening onto private custom designed mosaic pool and hot tub, 2 guest rooms with full bathrooms in suite, sauna, and powder room. Home is furnished with custom imported furniture designed by renown SF Interior Design firm. Home was recently featured in various home and architectural publications, and was also used as a movie set and backdrop for fashion magazine photo shoots. Former home of Jefferson Airplane lead singer Grace Slick. Grace personally designed the spectacular mosaic pool. Multi level limestone patios with Balinese outdoor lounge furniture. Full fenced in lawn and gardens overlooking the Pacific. Come discover Bolinas! It’s a very special place. It’s a beach town, with great surfing, famous artists who frequently display their art in the downtown gallery and museum, fun live music at the downtown pub, all organic food in the local restaurants and downtown food market, well maintained public tennis court just steps from the house, great hiking and biking trails, fabulous boating and kayaking, great bird watching with the Audubon society’s bird reserve just a mile from the house, well regarded Yoga and Pilates classes offered 2-3 times a week in downtown Bolinas - drop ins welcome. Summers in this home are unforgettable! The Fall and Winter are very mild and just spectacular! E-mail today to find out about availability - you will love the home and the town! This home is ON the beach - enjoy the sound of waves splashing on your deck! Mr Steam in Master Bath, Jet Tub in Guest Suite, Multi level limestone patios with Balinese outdoor lounge, Full fenced in lawn and gardens overlooking the Pacific. LIAM R.Edale, Peak District National Park, U.K. 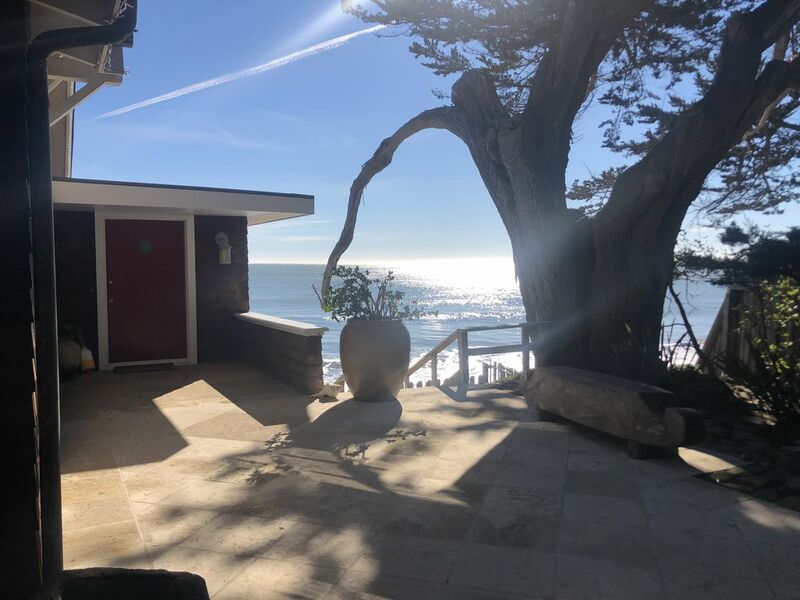 The label "Spectacular Ocean Front Home" is very accurate-- it is THE beachfront home in Bolinas. As a few of the reviews have stated, some of the rooms and furnishings are a little tired and funky, but that is what you should expect in Bolinas, especially given the very close proximity to the harsh weathering effects of the ocean, not to mention the local culture. This home is very well equipped and a great layout for a gathering of family and/or friends. We had two young children who loved the many toys, books and large play spaces. The views from the primary living area, kitchen and decks are absolutely spectacular and the very expansive outdoor entertainment spaces are incredible. The two downstairs guest bedrooms almost make you feel like you are on a boat because of the close proximity to the ocean, especially at high tide when the waves literally spray the windows. Because we were there for a large family wedding, we visited a number of other rental homes in the Stinson Beach area and this was, far and away, the best of all of them. Cool in its day needs some TLC. Yuckyvcarpet in master bathroom and lots of cob webs. This home was very cool in its day. We didn’t think it was maintained well enough to charge the rate we paid. The home is right on the beach great views with cob web filled glass. De-webbing is needed. The master bath would be much better if the yucky carpet was removed and shower re-tiled. The place needs some work but the beach location is great. The ocean, the beach,the mountains the views from every room,, the cute friendly little town, are a perfect back drop to this perfect house. Easy casual California vibe, fabulous kitchen, modern bathrooms, multi level patios, tiled pool. what more can you ask for? This house is on the main road through Bolinas that leads to the ocean, and is as close to the sea as it can be without being underwater. Staying in this house is like staying on a giant stationary ship. The ocean waves crash against the front of the house. The downstairs bedrooms provide an amazing opportunity to view the waves from the comfort of a bedroom or even a bathtub. The views are mesmerizing. It’s hard to do anything in this house other than gaze at the ocean. This house would be especially great for people who love the ocean but cannot easily spend time on the beach. Every bedroom has its own lovely bathroom—it was hard to choose which room to stay in. The steam shower and hot tub were awesome. The pool was too cold to swim in, but my nephew had fun going in there with his wetsuit on, and the pool is beautiful. While the house is not child proofed, it is child-friendly, with an ample supply of toys and lots of outdoor space to play. The caretaker was friendly and helpful, and the owner was responsive and easy to communicate with. Bolinas is indeed a hidden gem with a great grocery co-op and an artsy bohemian feel. On the path to the beach someone wrote "For many of us, this place is sacred space." I felt that. I would consider myself lucky to get to return to this special house with my family next year. Come discover Bolinas! It’s a very special place. Bolinas is a beach town, with great surfing, famous artists who frequently display their art in the downtown gallery and museum, fun live music at the downtown pub, all organic food in the local restaurants and downtown food market, well maintained public tennis court just steps from the house, great hiking and biking trails, fabulous boating and kayaking, great bird watching with the Audubon society’s bird reserve just a mile from the house. Bolinas downtown is just a short walk from the house.